At Center Valley, our goal in P.E. is to teach students the basic skills for movement, activity, and sports, in hopes that they find something that interests them and helps them keep moving throughout their lifetime. Each class comes to P.E. two times per week for 30 minutes. 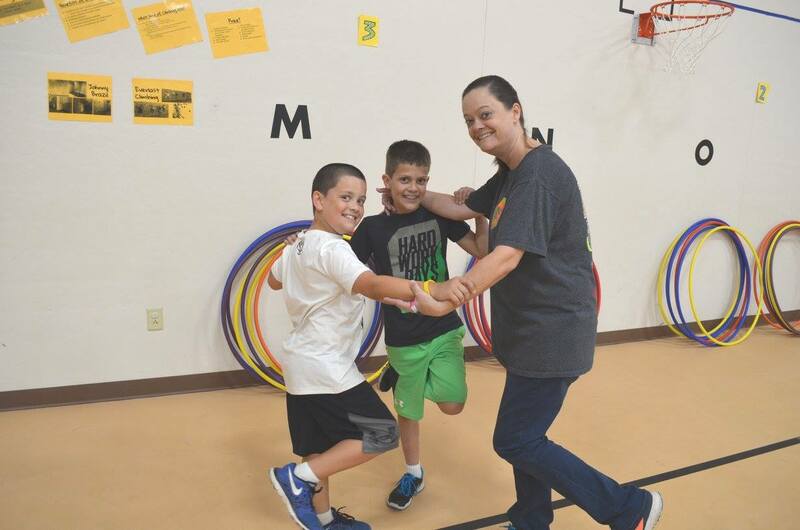 We teach units or activities for two weeks at a time and students learn a variety of skills from cup stacking, jumping rope, dancing, basketball, disc golf, and even fishing! In P.E., students learn to challenge themselves, to set goals and work towards them, and to work well with teammates, all while gaining more confidence in their abilities. We want all kids to have fun while learning and moving. In addition, we offer several special activities and opportunities throughout the year to encourage students and families to be active outside of school and at home. Second Grade - Lifetime Fitness Day - Russellville School District second-graders gather at the Russellville Country Club and rotate through multiple stations promoting lifetime physical activity: fishing, tennis, gold and lawn games. Third Grade - Kickball Tournament - Russellville School District third-graders get together at Hickey Park and play in a Round Robin Kickball tournament. 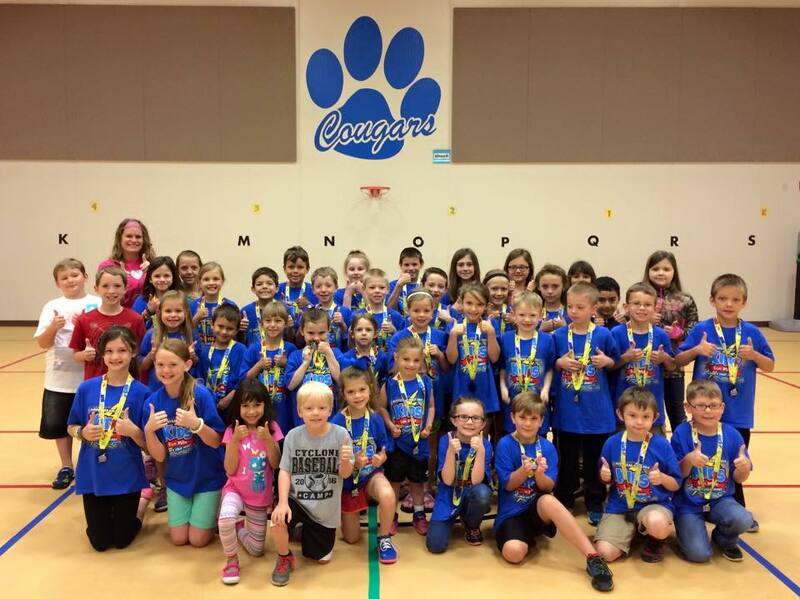 Fourth Grade - District Track Meet - Before transitioning to fifth grade, all fourth-graders meet at the RHS track and compete in a Track Meet through running events, relays, and field events. Farm to You (every other year) - All students rotate through stations learning where their food comes from, how it ends up on their table, and the benefits of eating healthy. 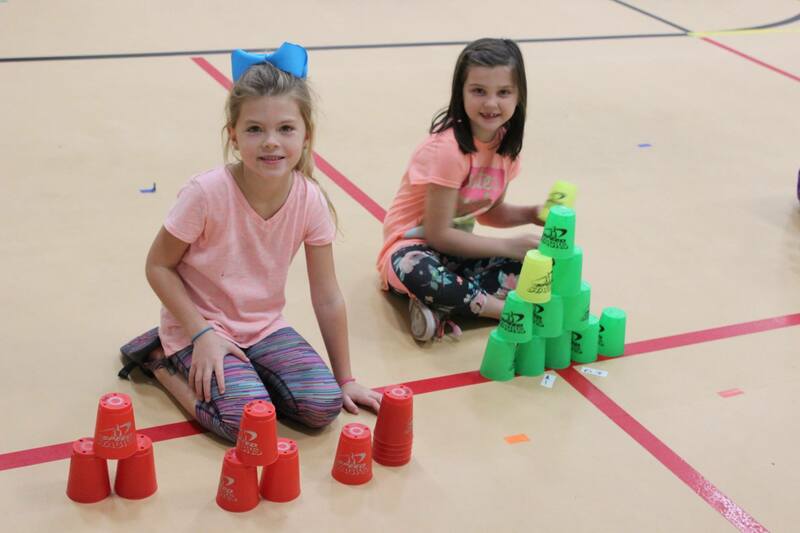 Cup Stacking Day is a chance for all students to learn coordination and stacking skills while racing against the clock. What fun! Field Day is the best day of the entire school year! To make it happen, we always need parent helpers. Each spring, a school day is devoted to a variety of fun games and physical activities, and all classes participate in a rotation. Families come to our school gym one evening (fall and spring) for Family Fitness Night and work out together by participating in games and activities. It is a great way for them to see how fun it is to move together. Jump Rope Club - Each student will get an opportunity to try out for the jump rope club during their P.E. time. Each grade level has different qualifications depending on their age. Cruzer Club - Each student/family will have an opportunity to walk/run 13.1 miles from March to mid-April. Fitness Club - Third and fourth-graders get to choose between different specialty clubs to attend. We learn different routines and perform for the school and at basketball games. Fitness Club - Below is a link to a purified YouTube video that has the song we are using for our December performance. I encourage you to practice at home as it takes everyone doing their jobs to make our TEAM performance amazing!